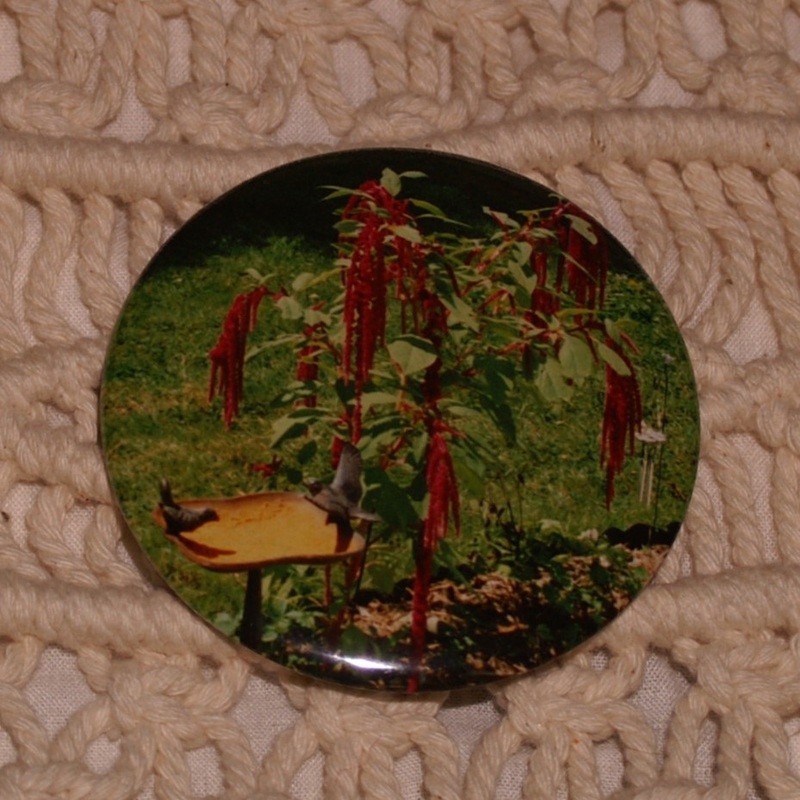 First 2.25″ Button made with an actual photograph. Yes! I have new toys! I can now make 2.25″ button pins, magnets, and pocket mirrors. Key chains and bottle openers will be added later. Best of all, I got a special punch sized for thicker photo paper, so I can make 2.25″ buttons with printed graphics OR actual photographs. Yes, real photos! Remember those things? No computer or printer required. The button in the photo was my very first 2.25″ button, and of course, I had to make it with a real photo. I believe the plant is called “Love Lies Bleeding” and I think that gray thing must be a real bird on the mini bird bath. Now I am looking for local venues where I can make photo buttons on the spot… yes, BYO Photos to have them put on a button. I should make flyers to send to churches and organizations who may be interested in hosting a photo button day. It should be announced in advance so people have time to have copies made as I do not want to cut up someone’s only photograph of a beloved pet or sky diving adventure. Here’s the old bag… new to me, purchased from “Lola Bean’s Boutique” at the Pop Up Evening Market at McKelvey Gallery ONE inside the Knox Building at 110 W. Federal Street in downtown Youngstown. If you are not local, check out her Etsy shop. I could not pass it up… just seeing it took me back ye almost 40 years. 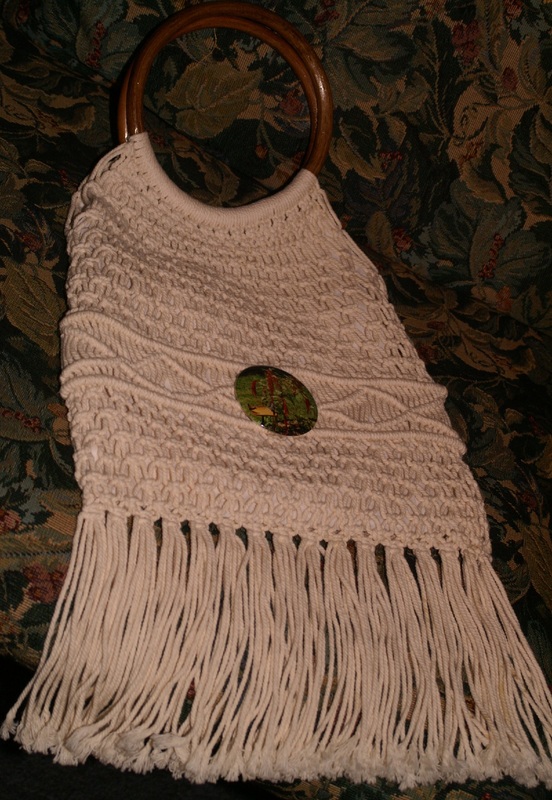 Besides, with all those fabulous knots, it is the perfect bag to pin on buttons. Oh, almost forgot… the Pop Up Market is a 3 day event. If you plan to go, the hours are 5 to 9 PM. There are two nights left… March 25 and 26, 2015. There are five vendors (no, not me… just plugging it because I love sharing what is going on downtown here) and each is unique. I might go back again to check out the scented oils or whatever the perfume things are… might stay long enough to order a fabulous burger, too.